This course will allow you to perform procurement and sourcing transactions using SRM Applications.Supplier relationship management (SRM) involves collaboration with suppliers that are crucial to the success of an enterprise. The goal of Supplier Relationship Management is to maximize the value of the collaborative relationships with suppliers. 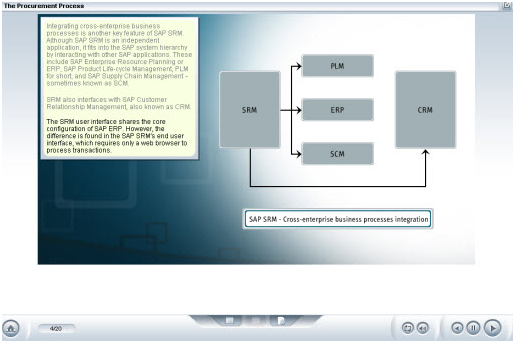 SAP SRM represents a strategic approach to procurement and supply that is tightly integrated with other components of the SAP Business Suite. This course provides an overview of the concept of SRM and leads into detailed content concerning SAP's approach to Supplier Relationship Management. 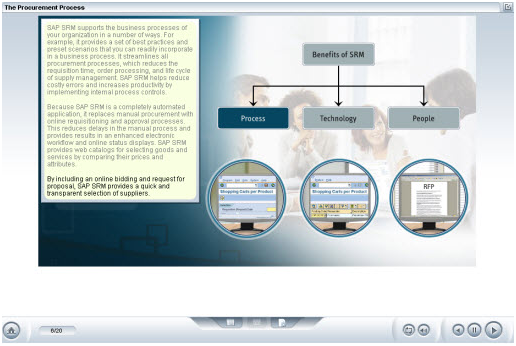 The course introduces two main components: Procurement and Sourcing. Some of the more common concepts such as requisitions, order management and receipt, as well as supplier sourcing are described in some detail.